I like to keep it simple when styling my hair. I don’t have time like I used to try a new hair do every day. 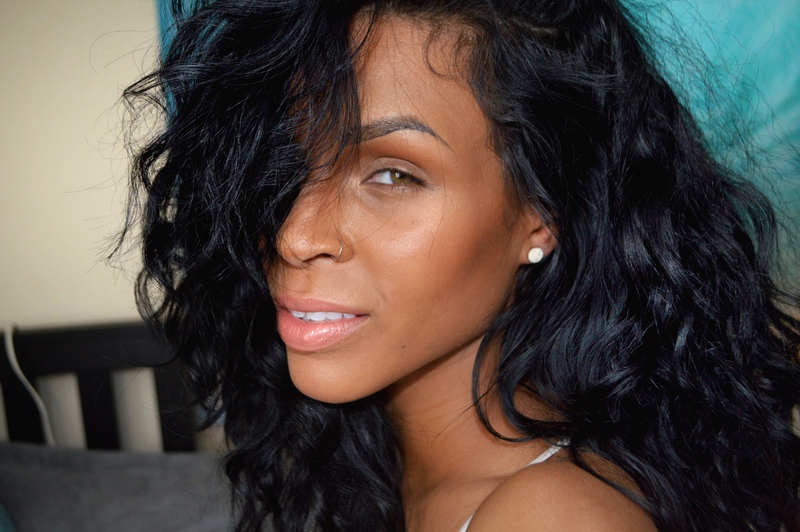 Often I go back and forth between wearing it straight for a few weeks then back to curly for a week or two. Wearing it curly though involves a lot more effort and a lot more products .… But I’ve started a routine thats just a little easier for wearing it curly/wavy that also doesn’t involve me getting my hair wet every morning before going out into the winter cold! So at night I’ve started to put my hair into two french braids after it’s been washed and is fairly close to dry, or I’ll just wet it down to get it a little damp but not soaking wet (towel dried hair)..You want the hair to have enough moisture that it will set over night and be the slightest bit damp when you take it out in the morning. 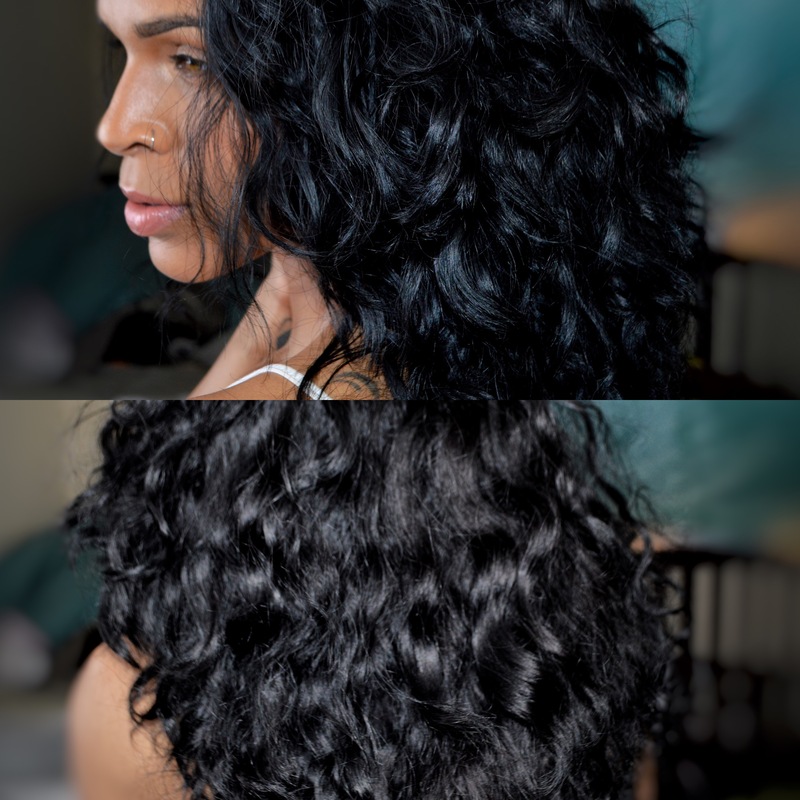 That way your natural curl can still over power some of the waves that have been set from the braids so you’re not left with hair that looks more “crimped” than wavy or curly. This is my hair after it’s air dried and brushed through in its normal texture. **Towel Dried Hair-Very important when styling hair! If you ever read glamour tips on styling or listen to a stylist giving advice they usually start by saying begin with towel dried hair. I used to think this meant you hop out of the shower, scrunch your hair in the towel, ring it out a few times and then you should start styling..that’s close.… But not enough. It means the hair is about 85% dry, which is actually closer to being almost completely dry than it is to being damp. When the hair is too wet you’ll probaably spend all this time running a blow dryer and brush through your hair thinking it’s being styled, when really you’re still just in the first step of drying your hair. Instead start by “rough drying” your hair which is just running your hands through your hair, tussling it under your blow dryer. This will cut your time in half! Your hands will absorb so much more moisture than a brush will, allowing your hair to dry a lot faster. When the hair still feels a little wet, but it’s becoming too dry to easily run your fingers from the roots through the ends, then that’s when we can stop rough drying and then begin styling!… Same goes for setting your hair with flexi rods,rollers, or wrapping it in a bun for beach waves, round brush, Denman brush, the list goes on and on. BTW this is a fairly new routine for me thats why my braids look like S#!T.. I really have no idea how to braid and no YouTube videos or Pinterest pins can save me!.. So don’t judge me.… Or my sweater.… its my old comfy sweater. 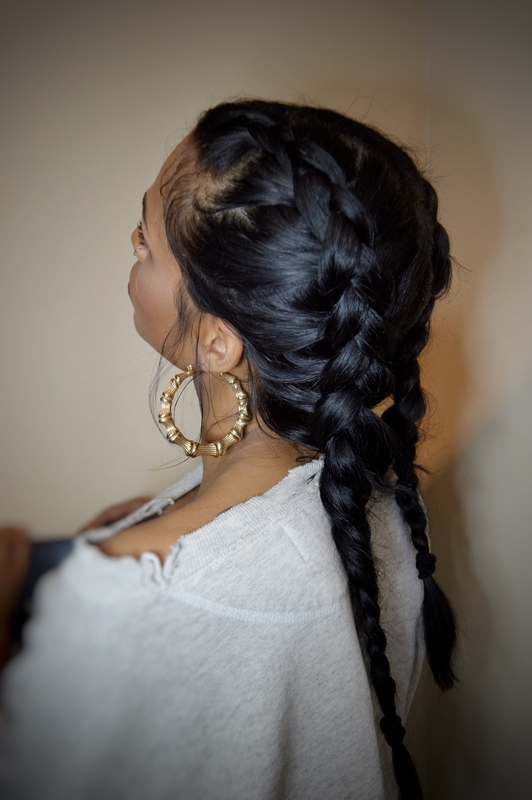 ….Then in the morning after I’m all ready to go I just take the braids out and tousle my hair and go! Finding the right products for your hair is also very important. I mix it up a lot when it comes to what I use to achieve the style I want. One brand that I have been using for over a year now is OGX. I am obsessed! 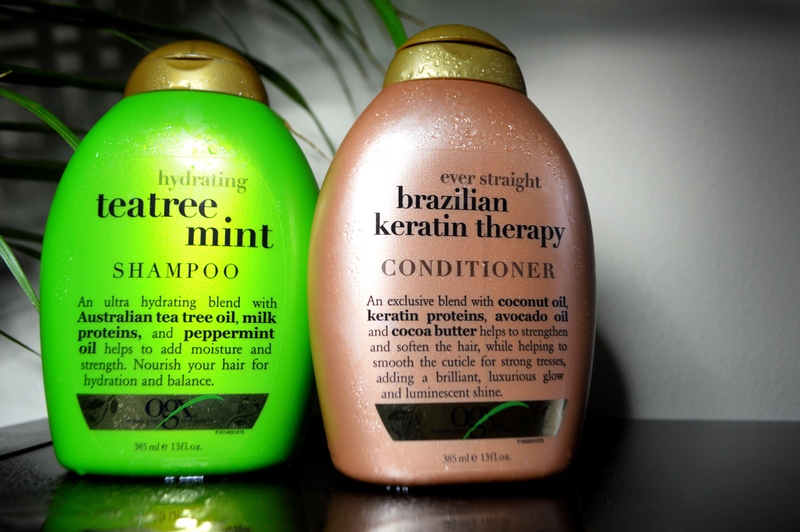 They’re conditioners are what really got me hooked. The Brazilian Keratin Therapy conditioner is the one I’ve been the most impressed with. 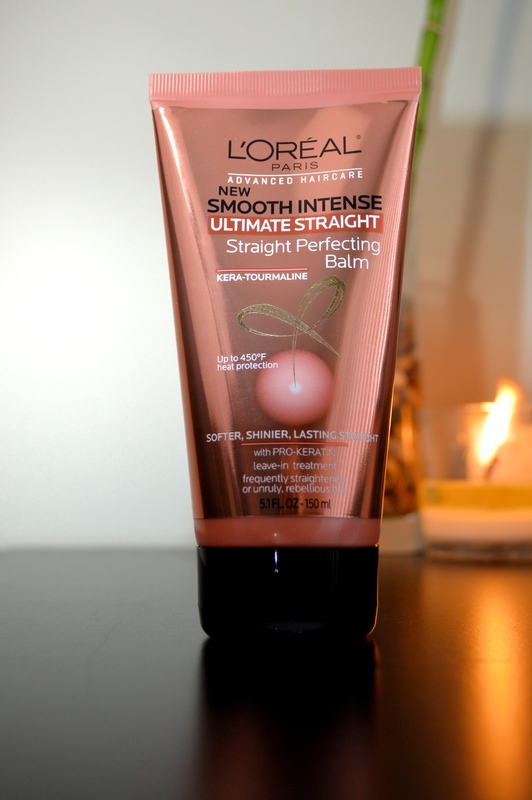 For thick and even extremely textured hair I think this one works wonders! Its pretty heavy, which is what I love. My hair has been through some traumatic experiences (aka trying to be Beyonce Blonde) over the last few years so it needs a lot of TLC… Most of their conditioners are meant for deep hydration, and you’re supposed to leave them in for about 3-5 hours. I like to use a leave in treatment that has a heat protectant in it whether I’m using hot tools or not. Think of this as a primer for your hair. If you’re setting your flat iron to 500 degrees it sure won’t save your hair from that kind of torture, but it does help to give the hair extra condition and it will give a nice barrier between the heat and your hair, and protect from natural elements we forget can be damaging to our hair no matter what texture of hair you have… Like the sun or dry weather. Whenever I see someone with pretty curls I can’t help but ask what products they use… and I have heard a lot about this brand Carols Daughter. (Also a lot about MixedChics as well but I haven’t tried them yet!) The Hair Milk Styling pudding is the first product I’ve tried from them and I feel like it does exactly what it says it will right on the jar. Depending on how much you use at a time I think it can work well on a lot of different curl patterns. 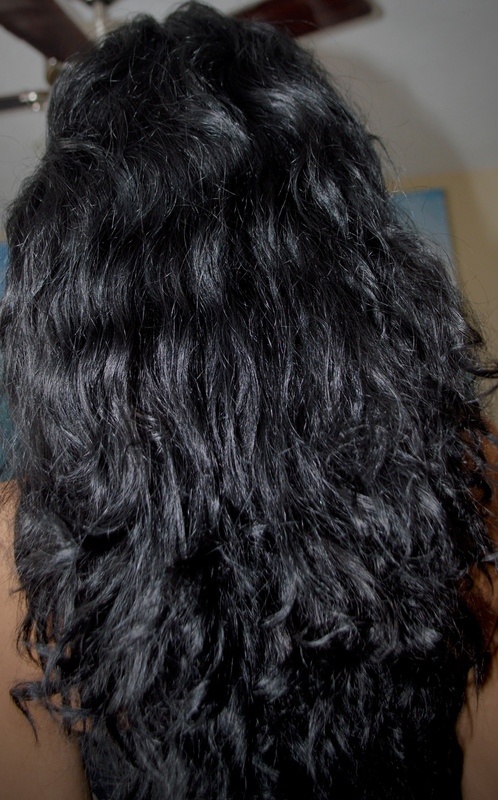 For my hair I only need about a quarter size amount to run through the areas that generally get pretty frizzy. 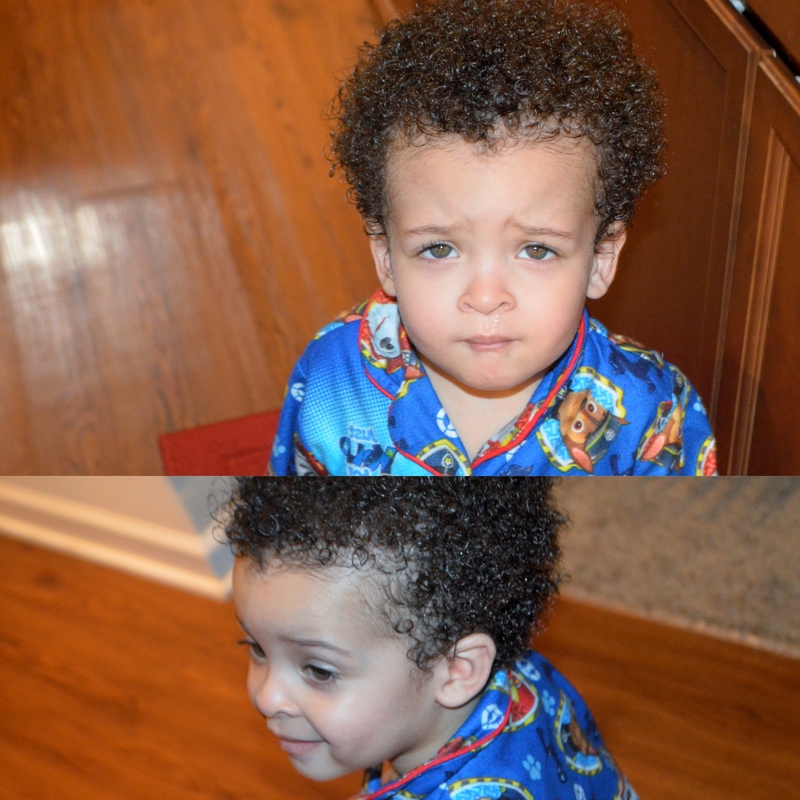 My sons hair has a lot more of a tighter curl and it gets really frizzy and tangled easily so on his hair I actually use about a quarter size in large sections of his hair and it separates his curls really nicely without looking greasy. 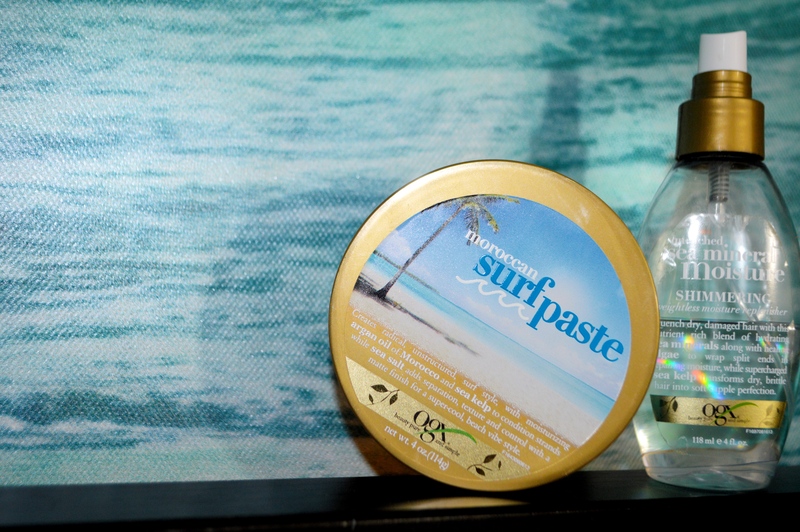 The Surf Paste from OGX works really well when I rub it on my finger tips and run it through my ends and sometimes even twist the ends for a more textured boho look. The Shimmer Moisture Spray just adds shine but it also smells really good! …. Oh yeah and all of these products are under $10 each!! AWWW thanks so much Porsha!! I told you I’m praying Malcolm grows up to have some of your hair! ugh you also need to wear your hair in those two braids!!! That looks super cute! Lol oh trust me I can’t braid either!!! That picture of my two braids took wayyyyy too long and I was trying to make it pretty for the pic… Any other day it’s a hot mess!!! !